Good lather is necessary for clean hair. Hair washing is a highly individualized process. The technique used during washing and the frequency of washing are both aspects of a hair care routine that need to be carefully examined by an individual. Many people may find that their hair washing routine is actually inadequate for their hair type. Moreover, the hair care products used for hair cleanings should also be examined by their users. Using improper hair products with a poor washing technique can be damaging to the hair shaft and scalp. Furthermore, the frequency with which you wash your hair will markedly affect the overall health of your hair. Understanding the unique nuances of your hair and scalp type is the first step toward an individualized hair washing routine. How often you wash your hair should depend on your hair and scalp type, not on any broad advice from a hairdresser. 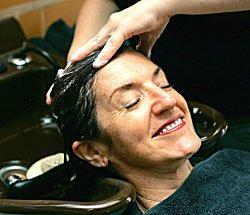 In the past, there have been mixed opinions amongst hairdressers regarding how often the hair should be shampooed. Some stylists have recommended that the hair not be washed every day as this can dry out the hair shaft and over-cleanse the scalp. Though such advice is well-intended, this does not represent the consensus of all hair specialists. In fact, such advice can be very damaging. Hair that is oily or develops build-up on the scalp at a faster rate needs to be washed according to the rate of build-up. The goal of hair washing is to cleanse the scalp of impurities, allowing the pores and follicles to be free of oils and debris. If your hair begins to look dull and oily by the end of the day, it will look even worse the following morning when attempted to go without a washing. Individuals who suffer from hair loss will also benefit from a clean dry scalp. Infrequent washings may allow more hormones and sebum to accumulate in the follicles, thus furthering hair loss problems. Dandruff is another tricky situation that may be aided by more frequent shampooing. Renowned celebrity hair advisor Josh Rosebrook points out that dandruff may look dry and flaky, but it is typically a condition caused by excessive sebum on the scalp. Not washing your hair often enough only exacerbates dandruff, leading the condition to appear more severe. According to Kingsley, hair should be washed "daily". Some individuals, however, have genuinely dry scalps. Daily washings will only dry the scalp out further. Such persons can often go as long as a week without a shampoo, though most individuals are not blessed in this manner. Over shampooing occurs when the scalp is now overly cleansed, irritated, and the ends of the hair begin to look dry and frayed. In some cases, and individual may have an oily scalp, but dry ends. This sort of combination hair can create a real conundrum for a person. In such cases, the hair must be washed frequently while employing a high quality conditioning shampoo, and an equally high quality conditioner can help to maintain a smooth hair cuticle. The hair washing controversy doesn't end when you've chosen a cleansing schedule. The types of products you use to cleanse your hair can have a profound impact upon your hair texture and health. Volumizing: Coats the hair shaft to promote fullness. Moisturizing: Contains emollients to combat dryness. Fortifying: Contains proteins to aid hair structure. Smoothing: Coats the hair with silicones to encourage a straight cuticle. Shine Enhancing: Contains shine enhancing agents such as silicones. Gentle: Uses lower concentrations of detergents and foaming agents. Daily Use: Often similar to gentle formulas, offering a basic amount of detergent. Clarifying: Uses higher concentrations of detergents to strip the scalp and cuticle of product build-up. Some individuals feel that shampoo is entirely unnecessary. They may cleanse their hair only with apple cider vinegar, herbal tonics, or just water. Shampoo can prove too drying for certain hair types. In certain cases, a person may only use water to wash the hair and a conditioner at the end of the process. This technique is called cowashing. The cowashing method is often helpful for individuals with normal healthy scalps who possess very thick and sometimes unmanageable manes. Shampoo may dry out the hair shaft, leading to impossible tangles. In such cases a conditioner-only method is employed to keep the hair cuticle sealed such that long or excessively curly hair types can be managed and untangled with a greater ease. Problematic scalps will not usually do well with this method, as conditioner may only add to the oil and build-up dilemmas. Real Simple offers detailed advice regarding cowashing. Many shampoos contain potentially harmful foaming agents such as sodium lauryl sulfate. This chemical is not always aggravating to all individuals, but it has been clinically implicated in conditions such as scalp irritation, flaky scalp, and even hair loss. Though there are several shampoos on the market today that do not contain sulfates, some persons choose to forgo shampoo altogether. The issue of whether to skip shampoos is a highly individualized matter. Shampoos contain detergents that break down scalp oils, a feature that water does not offer. Herbal tonics may be soothing to both the scalp and hair, but for scalps that develop build-up quickly, non-foaming cleansing methods may only encourage build-up. In such cases a little stripping of the scalp and hair cuticle can produce beneficial results so that the hair is not weighed down by oils and debris. Apple cider vinegar has long been hailed as a scalp exfoliant. However, vinegar breaks down proteins and some people may find that the long term use of apple cider vinegar is too harsh and caustic for their hair cuticles. Moreover, and for this reason, apple cider vinegar tonics should never be used on heat-damaged or chemically processed hair. When you are shampooing there are various techniques for actually cleansing the hair. Some persons pile their hair atop their head and begin an intense cleansing process. 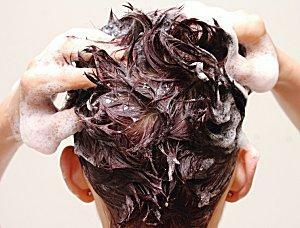 Others simply cleanse their scalp with shampoo and allow the excess to pour down the remainder of their head. If you hair is fragile and prone to breakage, the latter technique is safer for maintaining the integrity of your strands. The former technique may allow for a more thorough sudsing, but it can promote tangles and breakage if one shampoos too intensely. Phillip Kingsley's blog offers a three part series regarding "Hair Washing Myths", starting with pre-shampoo methods and ending with conditioning routines and scalp toners. There are many myths and misleading ideas that circulate within the hair care industry. Some of these myths focus on the washing of hair. You can familiarize yourself with these concepts reading a resource like Hair Washing Myths from Women's Health Mag, but it is important to remember that no one knows the way your hair and scalp respond to a regimen better than you do. Advice that produces subpar or even downright poor results is not advice that will lead you to a cleaner, healthier head of hair. Providing your hair with well-formulated cleansing agents and keeping to an individualized washing schedule is key to optimal hair health.